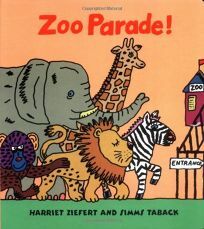 Harriet Ziefert and Caldecott Honor artist Simms Taback team up for two oversize board books designed to encourage toddlers to join in with animal noises and movements. ""Can you baa like a sheep?/ Sing like a bird?/ Whinny like a horse ahead of the herd?"" asks Noisy Barn! While Zoo Parade! invites youngsters to get on their feet: ""Can you prance like a lion?/ Dance like a gazelle?/ Run like a baboon with a high-pitched yell?"" Taback's signature black line and bright, bold colors add to the energy of the text.